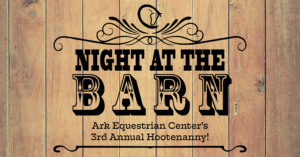 Come on down to Ark’s Equestrian Center on August 10th for an evening of music by Westbound 40, hot grub prepared by Born in a Barn, dancing, a silent auction, a shootout by the Widowmakers, and a chance to win a Henry Rifle, whole hog, or a saddle! Adult libations from Northridge Discount Liquors will be available for purchase. Children 5 and under - free 6-15 years - $10 16 years and over - $25 Tickets can be purchased at 1375 N Pine Street or at www.arkhorses.org All proceeds will support Ark’s Equestrian Center.